The place to discuss development topics. Discussions on the RICOH THETA API and SDK, image processing of spherical images, other hardware related topics, introduction of useful libraries, etc. that is generated on the device. ffmpeg -i "ricohtheta.mov" -an -f image2 "output_%05d.png"
file, without having to use the desktop DualfishBlender application. Would it be possible to get these algorithms or have an API to do so ? Also what are the image sizes of the frames in the .mov file, are these lossless images ? Are they cropped in some manner ? is extracting an image file from a .mov - pre-conversion the best way to get the images from a video file on the Ricoh Theta M15 ?, Is there a way to get a RAW video file ? I would be interested in the unwrapping algorithm as well. They look like GPU instructions. mbirth wrote: They look like GPU instructions. They are OpenGL instructions, although I'm not sure how to implement them. I'm writing a Python script that breaks the .MOV to individual frames, splits, rotates, and de-fisheyes each frame, then recombines them to a x.264 video, then runs the YouTube .py script to enable the spherical video paramaters on the video as a whole. The de-Fisheye method is the one i'm having the hardest time with, primarily because I don't have the calibration constants for the camera in video mode. If anyone has these constants, I'll be happy to share my Python script so we can convert on whatever hardware we choose. Similarly, if someone can help me port mbirth's scripts to PyOpenGL commands, I'll implement them there as well or instead. mistapottaOHS wrote: The de-Fisheye method is the one i'm having the hardest time with, primarily because I don't have the calibration constants for the camera in video mode. Now that you're saying this, I could try to play around a bit more with nona. This can also be used to combine two 180° images to one 360°, I think. i w960 h960 f2 v197 r90 p0 y0 n"frame_l.png"
i w960 h960 f2 v197 r90 p0 y180 n"frame_r.png"
p w1920 h960 f2 v360 r0 p0 y0 n"JPEG q99"
Close, very close, but the stitching is a bit off, can I see your code on Github ? I'm afraid it's only these few lines I tinkered with. There's no code for video-dewarping yet. Not even a script. I want to find the correct parameters first before doing batch processing. Looking at this video: https://www.youtube.com/watch?v=QUkt4y1idpY it seems there's yaw/pitch/roll information for each frame in the MOV file somewhere. At least that's the only plausible reason for the image tilts in the corners. This metadata would be needed, too, for successful conversion. mbirth wrote: Looking at this video: https://www.youtube.com/watch?v=QUkt4y1idpY it seems there's yaw/pitch/roll information for each frame in the MOV file somewhere. At least that's the only plausible reason for the image tilts in the corners. This metadata would be needed, too, for successful conversion. So I think the tilt information is stored in the "TiltStream" of the MOV file. Has anyone made progress with an example script? Thanks for any help. 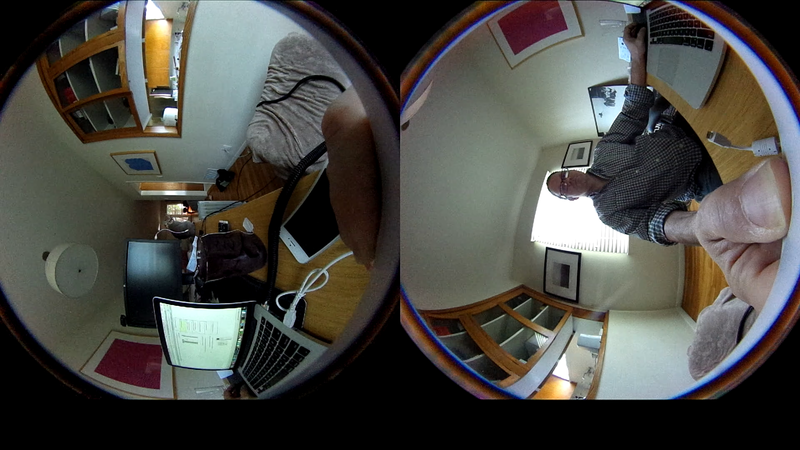 Hey mistapottaOHS, I'm trying to stitch together a dual fish eye stream to output an equirectangular video stream. You mentioned a Python script? Have you managed to do it? Where are you at? Could you share your script for turning dual fish eye into a x.264 video? It would be really helpful to find out how you did it. Thanks a lot! From here, you will find that RTHU is the thumbnail and RMKN is the Ricoh MakerNote. So we can rule those out. Now I found this python code and you can add the identifiers found with AtomicParsley (RDT1, RDT2, etc.) to get the raw data of those atoms. And I guess the rotation information is contained in it. Somehow. EDIT: The video file has 3180 frames. So the size of the atom should be a multiple of that, I think. @mbirth Thanks for this info. 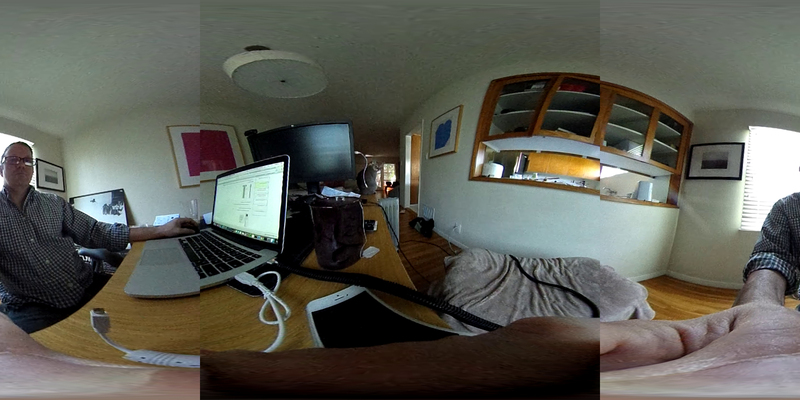 I've managed to get about as far as you have with 'de-warping' dual-fisheye to an Equirectangular image using nona and your pto file. Did you manage to get 'enblend' working at all, to clean up those edges? This is a great idea. Creating a filter for Camtwist. +1 starred. Thank you for your insight mbirth. Was able to remove pitch and roll by removing RDT5 (with unknown side effects) but good enough for me if it loads on youtube. Blog post on dewarping software. Relevant list. Original post has live links. THETA-S-LiveViewer-P5 by Kougaku. In Processing language. Has anybody complete development with an instance writing? Thanks for any assist. I don't know if this tool will work as expected, but from the description it sounds very promising. However, to have the ground at the bottom, you'd also need the orientation info per frame. mbirth, thanks for sharing this article. I shared this article along with some additional thoughts here. How could the algorithm for a single image be applied to a video? Does the developer need to process each frame individually in a loop? In order to do a clean dual-fish to equirectangular conversion, the developer will need the lens parameter information, which Ricoh hasn't released. However, maybe good enough is okay. As the source code is not available, I'm going to send the author, Paul Bourke, a note about the possibility of using the code for online education. Last edited by jackiee_jacky on 18 Feb 2019, 11:32, edited 1 time in total.